Nissan Cube Review: If you woke up this morning and thought, "I want to drive a crazy car," Nissan has built the perfect vehicle for you. It's called the Cube. Aside from the obvious, the fact that you'll be driving a square car with round windows, this thing is designed to be different from anything else on the road today. How many cars do you know that have shag carpet on the dash? Or a headliner that's contoured like the ripples on a pond? Or bungee cords on the doors for attaching stuffed animals? Or footwell lights that change colors disco-style? It's clear that people who buy this car want to be different. While it's priced like any ordinary compact car, starting a $13,990, there's nothing ordinary about it. The differences start with its Kleenex-box body. The concept of a square car for young people isn't particularly original, the Honda Element and Scion xB went down this road years ago, but the Cube takes the shape to a different level. While the overall shape is definitely boxy, virtually every surface tapers to a rounded edge. The windows are almost oval in appearance, while each of the straight edges is gentle and curvy in execution. And, perhaps most noteworthy of all, the back end is totally asymmetrical, painted on one side, glass on the other. Inside, you get the feeling that the Cube is being different for the sake of being different. All the strange things about it, the headliner, the lighting, the shag carpet, don't necessarily make it a better car, but they do make it a lot more interesting. Underneath all the weirdness is actually a good vehicle. It comes with a 1.8-liter engine that makes 122 horsepower which, at least on my manual-transmission test car, felt lively and peppy. I enjoyed driving this car more than I did the Scion and Honda boxes. That cubic shape, which isn't ideal for driving through gusty winds, actually makes sense when it comes to practicality. The Cube feels roomier and more livable than most compact cars, with plenty of head and shoulder room thanks to the upright dimensions. Cargo space isn't generous, but the back seat is. And, when you need to carry bigger things, the seat easily flips forward to turn the Cube into a miniature moving van. Fuel economy is good but not excellent, as you'd expect in a car with the same aerodynamic profile as a shipping crate. It's rated for 30 mpg in town and 28 on the highway when fitted with a continuously variable automatic transmission and, interestingly, a little worse than that with a six-speed manual. If you're looking for a car to turn heads without spending much cash, then this is a good one. Let's just hope those heads are turning for the right reason. What was tested? 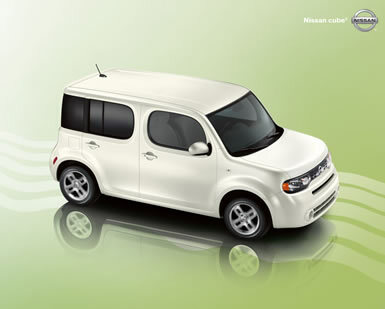 The 2010 Nissan Cube Base with a base price of $13,990. Options on the test car: none. The total MSRP price as tested: $13,990. Why avoid it? Some people don't like the styling. The Bottom Line: For a car called the Cube, you could be surprised to find all the rounded shapes when you look closely. It's designed to turn heads at an affordable price. The interesting styling extends inside the Cube, where its boxy shape makes it feel bigger than it actually is, and the interior design makes for plenty of head and shoulder room. The bottom line is that the Nissan Cube offers a lot of car for the money.